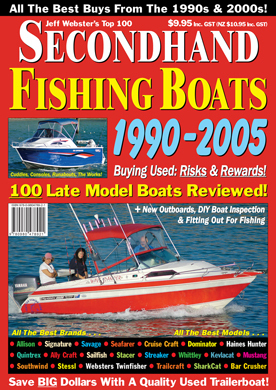 The fourth publication in Jeff Webster's series on buying a used boat is called Secondhand Fishing Boats 1990 - 2005. This glossy, 100 page magazine is jam packed with information and advice on what to look out for when buying a late model trailerboat. And as the name of the magazine implies, there are OVER 100 REVIEWS on boats built between 1990 and 2005. Secondhand Fishing Boats will prove invaluable to people looking to buy a good condition, late model power trailerboat. Secondhand Fishing Boats 1990 - 2005 opens with a series of chapters on how to inspect a boat, engine and trailer. This is essential reading for boating newcomers. The tips and techniques you can learn from these articles can help you avoid buying a lemon - and save you thousands of dollars. In addition to the chapters on buying a used boat, you'll find an article covering all of the new outboard types and brands, and another feature about how to set up your boat for fishing. Complimenting the technical articles are reviews on 102 of the best, most popular trailerable fishing boats manufactured between 1990 and 2005. Importantly, more than 80 of these boats are unique to Secondhand Fishing Boats magazine; you won't read about them in Jeff's other used boat guides. 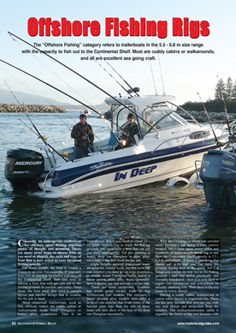 The secondhand boat review section of the magazine has been divided up into a series of categories to obtain a good cross section of boat sizes, types and models. The categories include Bay Runabouts, Family Cuddy Cabins, Coastal Fishing Boats, Offshore Fishing Rigs, and Canyon Runners. Each category begins with an introductory feature article to help explain the differences and similarities between the various boat types. If you're new to boating, these articles are essential reading because they will help you identify the type of boat most suitable for your style of fishing. Secondhand Fishing Boats 1990 - 2005 is a worthy addition to Jeff Webster's used boat magazine series. Even if you're not looking to buy a boat right now, this magazine deserves a place on your bookshelf because of the enormous amount of information it contains on a whole range of subjects. As a reference source alone, this magazine is worth the purchase price. Secondhand Fishing Boats is no longer available in new or unmarked "mint" condition. The only copies left are newsagent returns or "seconds". These magazines are complete, but they may have price stickers, scuff marks, creases, and texta marks on the covers, etc. Inside, the mags are whole and in good condition. To order one of these magazines, please send a cheque or money order for AUD $11.95 (includes $2.00 for postage) payable to Jeff Webster, PO Box 344, Labrador QLD 4215. NEED YOUR MAG ASAP? PAY BY CREDIT CARD & ORDER ONLINE. Payments can also be made instantly by Visa or MasterCard using Paypal. Click on the link below to Buy It Now - or add this title to your Cart (above left) to continue browsing. For more details, phone (07) 5594-0898. Chapt. 4 Repower: 2-Stroke Or 4-Stroke? Bulk Buy Pack. Buy Five Magazines For The Price Of Three. Click Here To Order!